Autosport Labs :: View topic - Wideband datalogging w/ the MJLJ anyone....hmmmm....hmmmm!? Autosport Labs Forum Index » Operation » Wideband datalogging w/ the MJLJ anyone....hmmmm....hmmmm!? Wideband datalogging w/ the MJLJ anyone....hmmmm....hmmmm!? For those who happen to own an LC-1 wideband by Innovate AND the MJLJ v4, you're in luck. You can datalog your AFR alongside your Engine Speed, Advance, Map/TPS info. I tested it out over the weekend finally. I went ahead and created a calibration file by dividing up the voltage range (0v - 5v) into 255 units (7.35 to 22.39 afr) then loaded it into the aux input channel. since it displays only in whole numbers i dropped the decimal and represented the 3 digit numbers (i.e. 7.35) with 2 place holders (e.g. 73) and the 4 digit expressions (i.e. 22.39) with 3 place holders and rounded up where necessary (e.g. 224) along the way. "Poverty is not a virtue." Excellent! Thanks for the calibration file, it can be onerous to make it by hand. Did it reveal any tuning 'surprises' for you? most certainly. got rid of an overly rich cruise condition AND big lean dip at WOT on a long straight. made the necessary jet changes. much much better. dyno time soon. 1. most wideband systems out on the market (AEM uego, Innovate, Zeitronix, etc...) output a 0-5v signal. 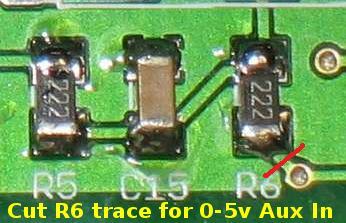 in order for your v4 MJLJ's Aux input to read the 5v input signal you'll have to perform a slight modification to the board that brentp has described already here towards the near bottom of the page. a visual for those already familiar with the instructions. * for v3 owners you'll need to update your firmware to v3.3.0 (currently in Beta) and download the latest v3 configurator software (also in Beta), and fab a secondary board for the aux interface. read more about it here. 2. afterwards, you'll need to provide the MJ with the appropriate calibration info in order to output the correct visual data. i've already done the math and outputted the data to 2 separate .txt files. the first is the spread just so you can see the voltage intervals from 0-255. the second .txt is the actual file you can upload to your MJ as the calibration file which i've gone through and rounded up the measurments to whole numbers and no more than 3 places. you can change the calib. file to your liking by using the spread.txt file as a reference. 3. and according to your brand of wideband O2, make the necessary ground and +12v connections and most importantly the 5v output connection from your WB to the MJ's aux input. *reminder, if you haven't already done so be sure to perform a free air calibration on your O2 before putting in place. just follow the manufacturer's instructions on how to do so. another side note, you'll get a more accurate reading with the WB O2 in the collector than from the tailpipe. at the tailpipe, there's too much available free air that can provide a leaner reading than if you were taking your reading from the collector. i take mine from the tailpipe inspite of the afore mentioned "fact". i run a narrowband simultaneously for comparison since i never leave my WB in for permanent use. Very cool, a friend has an Innovate LM-1 that I have been told I can borrow. Great job! i'm not familiar with using the LM-1 in conjunction w/ the MJ. the primary reason why i wanted to be able to log a/f directly via the mj was to be able to see ignition affects on a/f along side the timing, load and rpm data. i believe that should answer your question. Interesting idea- Dean944s first proposed this use. The logic was, If the mixture goes lean than protect the engine by adding retard. This capability is currently supported in the firmware. I think the wideband unit should respond fairly quickly. Who wants to try it out? The issue I can see with that scheme Brent is that on a trailing throttle you want a whole lot of advance. If the ECU is tugging advance because it notices that you are lean (which is what you want to be on a trailing throttle) then it's likely to make things a little lumpy. I think if you're going to do wideband based retard then I'd only do it on higher loads and at steady state. can you do pics or a video file about installation and testing session. It will be great. Chris you make a good point.. You need an "if then" statement that would also look at TPS or the MAP and only allow the retard at say 1/3 throttle or more... . . So brent how do we do that? I think the RaceCapture unit is the answer. I still want to wire it up and see what happens as originally proposed. It's a bit more complicated than just an if-then. You need also to smooth the input and only do something if the input has been above/below the threshold for a set amount of time. You need this delay to allow for the exhaust gasses getting to the sensor and in turn for the sensor to pick up the change. It's fractions of a second but at full throttle you may well be past that load site before you've had time to do anything about it! I've made this calibration file for MJlj datalogging the SlC Pure plus wideband from 14point7. It may also work with the PLX wideband controller.